Behind the fancy name are large and powerful pets who are not ideal for those who have never had dogs. 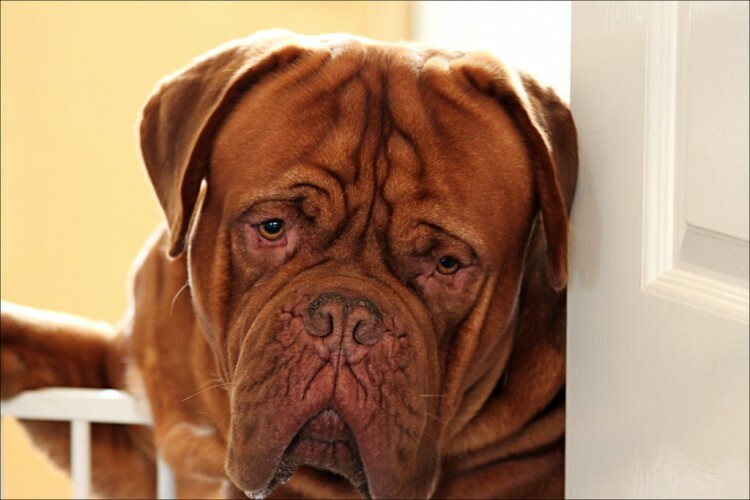 Learn more in this Dogue de Bordeaux breed profile. The Dogue de Bordeaux is an old French dog breed with a stocky and powerful body covered with loose skin. 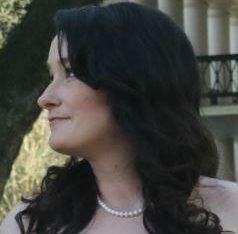 The breed’s trademark is the large head with a serious expression. The dogs have oval-shaped eyes that are set wide apart and come in shades of hazel to dark brown. Their ears are slightly rounded on the tips, set high on the head and fall back. The ears are typically a darker shade than the coat color. The tail is thick and tapered. The coat is short and soft, and it comes in colors of fawn, mahogany, red and isabella (grayish-yellow or cream). Markings include a black mask, brown mask, white markings or white patches. Some theories assert that these dogs existed before the Bullmastiff and Bulldog, while others believe the Bulldog contributed to the breed’s development. There was also a dog breed very similar to the Dogue during Julius Caesar’s reign in Rome. Additionally, the breed is thought to have ties to the Tibetan Mastiff, the Neapolitan Mastiff and the old Dogues de Bordeaux of Aquitaine. One thing’s for certain: The Dogue de Bordeaux is an ancient breed. The breed was originally classified by the dogs’ work and regions, which included Paris, Toulouse and Bordeaux. The dogs were used for protection, hunting and fighting. The versatile breed herded cattle and baited various animals, including bears and bulls. The breed declined during the French Revolution, when many of their well-off family members died. The breed also declined during World War II when Adolf Hitler ordered the dogs destroyed because of their fierce loyalty. The breed persevered, though, and later gained recognition in other countries. Dogues de Bordeaux were documented in the United States in the 1890s and later in 1959. The breed became more widely known after one of the dogs appeared in Turner and Hooch in 1989. The Dogue de Bordeaux Society of America was formed in 1997, and the American Kennel Club (AKC) added the breed in 1996. Dogues de Bordeaux are excellent watchdogs. They are loyal and close with family members, and fearless and courageous with strangers. You should thoroughly socialize them with other animals at an early age to prevent aggression. These dogs are not recommended for first-timers. Dogues de Bordeaux can be stubborn, dominant and display negative behaviors (destructiveness, aggressiveness) in the absence of a firm leader, training and socialization. 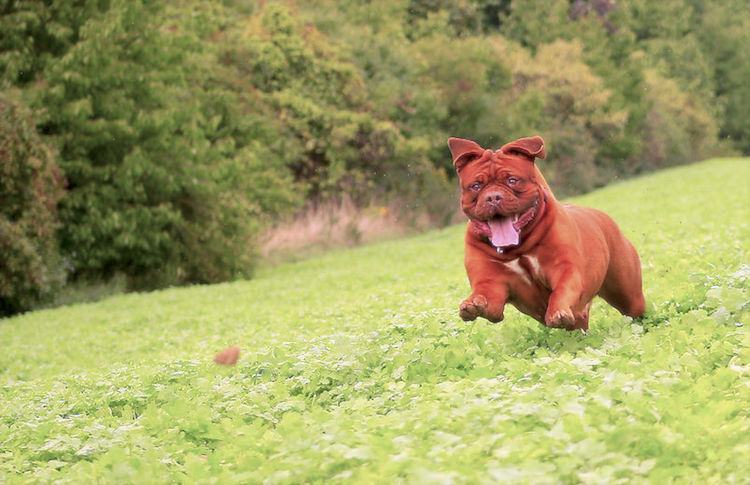 MEDIUM: Take your Dogue de Bordeaux on daily walks and offer extra physical exercise through obedience, agility, rally, carting, tracking, herding or coursing. The breed is not very active indoors and can do well in apartments. LOW: Dogues are average shedders with easy-to-maintain coats, but beware that they drool — a lot. Keep the skin folds clean and dry, and those thick nails should be trimmed every few weeks. Work these tasks into your grooming routine, along with keeping the teeth and ears clean. Many purebred and mixed-breed Dogues de Bordeaux are available in the United States, so check shelters and rescues first. If you decide to go through breeders, get to know them and make sure they are not running a puppy mill. Ask for health clearances on the puppy (or her parents) because of the breed’s long list of potential (and serious) health conditions, some of which are genetic. Responsible breeders will not breed Dogues de Bordeaux who will pass down genetic health problems. They should be ready and happy to show you their dogs’ health tests.